1. Log in at www.HotDoodle.com and click "My Stuff" on the navigation menu. 2. From the My Stuff page, click on the "Add or Remove Funds" link. 3. Click on the red "One Time Payment + Deferred Automatic Monthly Subscription" link. One-time payment + deferred automatic subscription– This option allows you to make a one time payment on your account for an overdue balance, wait some days, and then start an automatic monthly subscription. 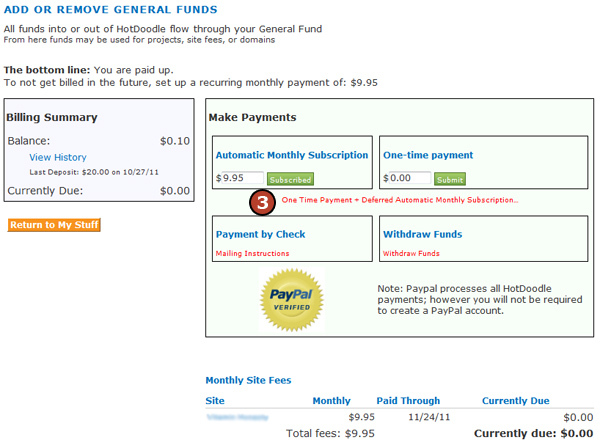 This is a great way to pay fees on an overdue site and then start monthly payments for the future. Pay Immediately: - Leave it at $0.00 or type in the amount for a one time payment. ...then wait for...: - Type in the number of days before the subscription will start. 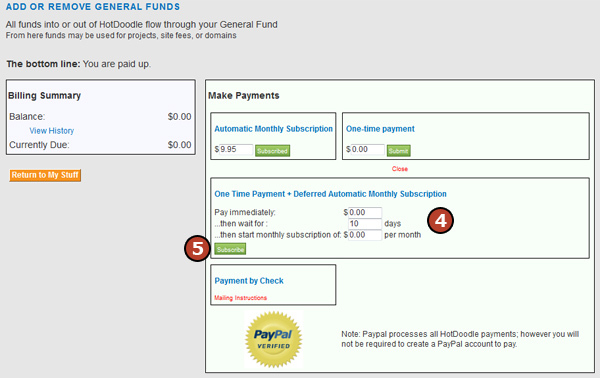 ...then start monthly subscription of: - Type in the monthly hosting amount for the website. 5. Click on the "Subscribe" button. 6. 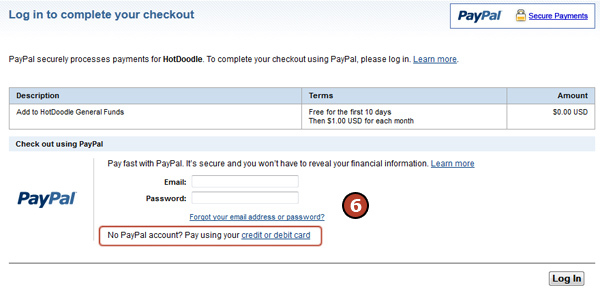 Either login to PayPal or simply pay with a credit or debit card by clicking the "credit or debit card" link in blue. Note: PayPal will not allow payment on a credit card or debit card that is associated with PayPal without logging in first.